In the midst of the third week of Lent, as we celebrate the Annunciation, it might feel like we are stepping out of the season a little bit. We turn our attention to the story of God’s initiative in sending the angel Gabriel to Mary, and the story feels more like something related to Advent or Christmas than to Lent. But the Annunciation fits well, not just because this feast falls nine months before we celebrate the birth of Our Lord at Christmas but because today, in the midst of Lent, we get to see Mary demonstrate for us the disposition we are all trying to achieve through our own Lenten practices of prayer, fasting, and almsgiving. Today we see Mary give her “yes” to God’s saving plan, and we are reminded of that freedom for love that true Christian discipleship demands. 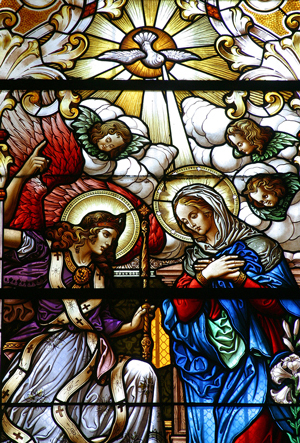 Even after the angel spoke with her, Mary didn’t understand the fullness of what God’s plan might entail, yet she opened herself—heart, mind, and soul—to God’s loving will. May Mary’s intercession help us follow her example today and always.